The current testing environment, casual in nature and highly fragmented, a redundant validation point, creates the opportunity to invest equally in the capability and infrastructure to step up as partners instead of service providers. The near ubiquity transformation of Quality Assurance made it imperative that Amber Development Support, as an organization, understands the challenges ahead and it`s prepared to seize the opportunities inherent in it. We offer a complete package of services with a broader range of analytic and consulting capabilities to help you redefine success and deliver a superior player experience. Our mission to advocate for the quality of the product, the experience of its players and the versatility through which we act, makes us both uniquely equipped and prepared to spearhead the quality of your titles to new heights. We drive quality across all aspects of the game development life cycle by creating, tracking, analyzing and reviewing all the planning, implementation and delivery process across the entire product. By determining, measuring and monitor key indicators, we`re able to offer the game development team a holistic, comprehensive and clear image, at every point in time, regarding the quality levels, implementation and delivery status along with a complete risk profiling strategy. 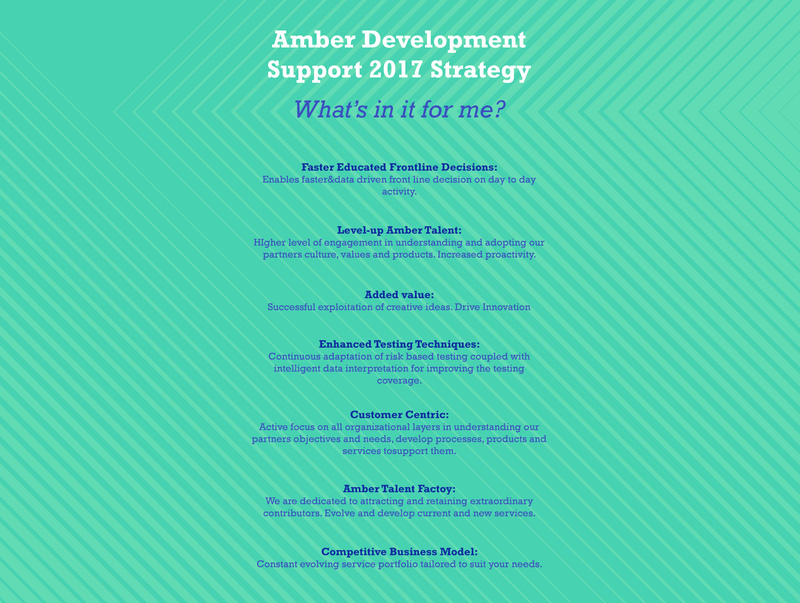 Amber’s strategy is supported by a veteran team of over 150 test specialists with an average experience of >3.5 years along with a proven track record of successful delivery of a little over 30 titles across all mobile platforms. Having a vast experience and expertise with both mobile and desktop environments, extensive knowledge of databases tools like: Jira, Hansoft, TestRail, DevTrack, DevTest and many others, we`ll establish a communication process that included weekly updates, bug and risk forecasting and executive reviews, allowing the stakeholders to grasp a clear and objective state of the project’s health. By developing a seamlessly extension of the core team and immersing into the development lifecycle we will better support and expand the range of testing and keep the QA practices in sync with the development schedule. Moreover, we will act as a constant driver of innovation. Bringing up front a success story: at the beginning of a new engagement, we were tasked with optimizing the QA release process by driving down the amount of time required to execute and sign off on the release candidate from 80+ Hours to 24 hours while maintaining and optimizing the device spread. We achieved this target by ensuring 3 full runs on each of the 3 builds prior to the release candidate and employing a risk based approach on the release candidate, dedicating 40% of the testing effort towards E2E sweeps and 60% of the effort towards high risk areas and previous fails. By switching to a sweeping approach instead of a granular one, we also managed to raise the number of devices covered from 3 per platform to a Top 12 device list per platform while also expanding the test to include a performance review, a Top 12 list of devices being determined by number of downloads and revenue grossing. Managing to remove the barriers of being remote and achieve a seamlessly integration with the development team eco-system we act as an active partner able to help in reaching your goals as global leaders in game development and sensational player experiences. Through this integration and deep understanding of your company values and objectives, we`re able to test with a business focus, positioning ourselves as de facto members within the game team, which in turn is enabling us to easily detect critical business process defects and inject value through the services we deliver. This smart eco-system enables our capabilities of using predictive analytics and data drive decision making to guarantee outclassing the objectives of quality and efficiency. Embedding early, providing strategy consultancy and fit-for-purpose test strategies we pave the most critical success steps in delivering a high-quality title with a rich and tangible impact on player experience. By defining, evolving and expanding the Quality Assurance industry best practices and through a tailored engineering solution, our team facilitates productivity, efficiency and creativity across all development teams. But our job doesn`t end when you ship your title, it`s only another step in a long and successful voyage. Our Launch Support and Live Monitoring team, along with our Customer Experience specialists will focus on enhancing the player experience, support the growth and coagulation of the community as well as attaining the business outcome. We create synergies between development teams and community, plus our contribution allows to fine tune the impact, presence, visibility and alignment with the broader concept of player experience.